Monmouth County Division #32 (Belmar) hosted their Annual Charity Dinner Dance, held on Saturday, October 28, 2017, at the Spring Lake Manor. 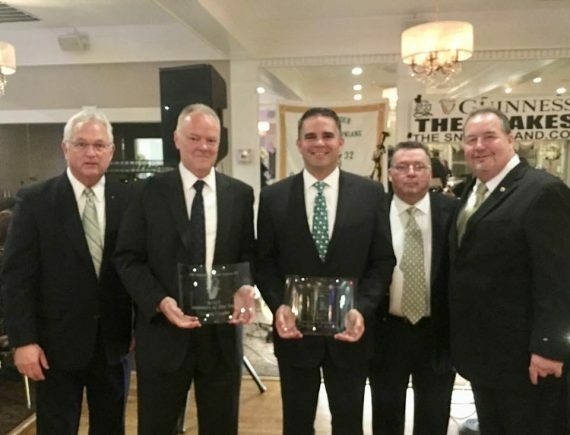 Special honorees included John Cardinal O’Connor Award winners Barbara Reilly from the Women of Irish Heritage of the Jersey Shore and New Jersey Assemblyman Sean Kean. Pictured are AOH Division #32 Trustee and Past President Kevin Weldon, Irishman of the Year Craig Coyle, from AOH Division #32 and the Friendly Sons of the Shillelaghs, Jersey Shore, John Cardinal O’Connor Award winner Mayor Matthew Doherty of Belmar, Division #32 Hibernian of the Year and Past President, John McAvoy and Division #32 President, Ray Barnes. Reverend Jerome Nolan of the Church of the Ascension, Bradley Beach, and Sister Jude Boyce of the Mount Carmel School in Asbury Park were on hand to receive scholarship and assistance donations from the Division. The Borough of Belmar was also recognized for it’s support and dedication to the community and residents. Musical entertainment was provided by The Snakes and an outstanding dinner and venue was provided by John Nagle and the staff at the Spring Lake Manor.